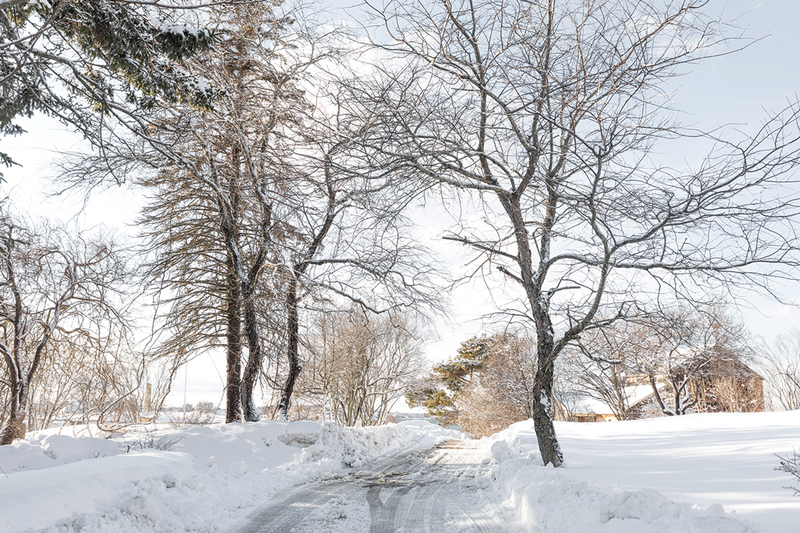 For the 900 or so year-round residents of Peaks Island, winter is a time to embrace the quiet, the cold, and the community. 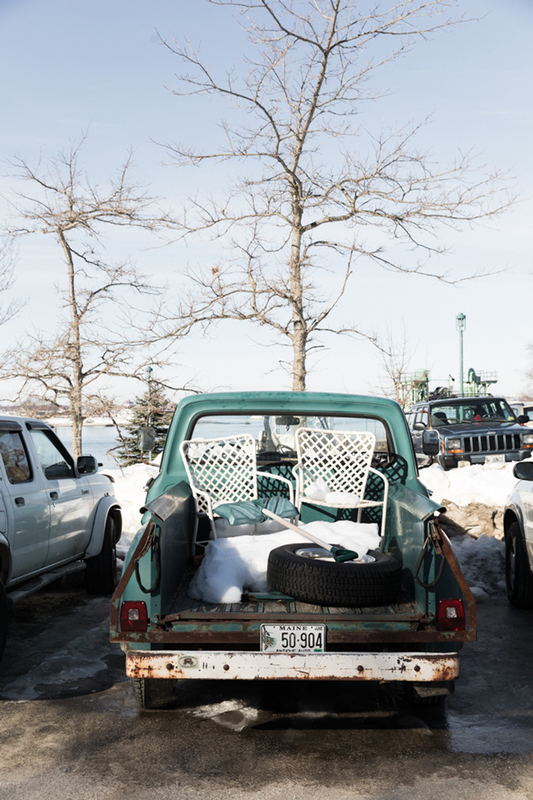 Sometime after the leaves have fallen, after the last googly-eyed tourists and summer folk have headed home, after the last skyscraping cruise ship has left Portland Harbor, a palpable shift occurs on Peaks Island. The collective blood pressure of the year-rounders seems to plunge, leaving us all a bit lightheaded at our own seclusion. From its midsummer peak, the population drops by nearly two-thirds, leaving only around 900 of us, although it feels like even fewer. Cottages are boarded up. 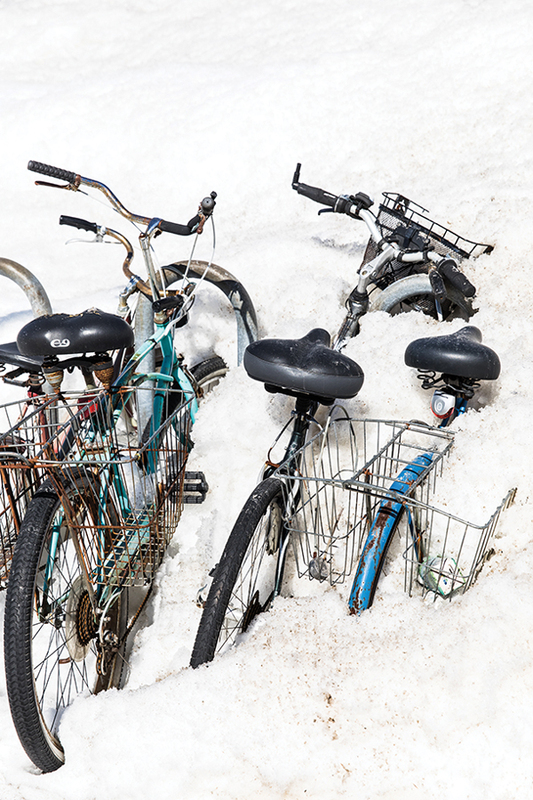 The roads, teeming weeks ago with overstuffed SUVs and tipsy sightseers in golf carts, are all but abandoned, turning avenues into playgrounds and side streets into basketball courts. 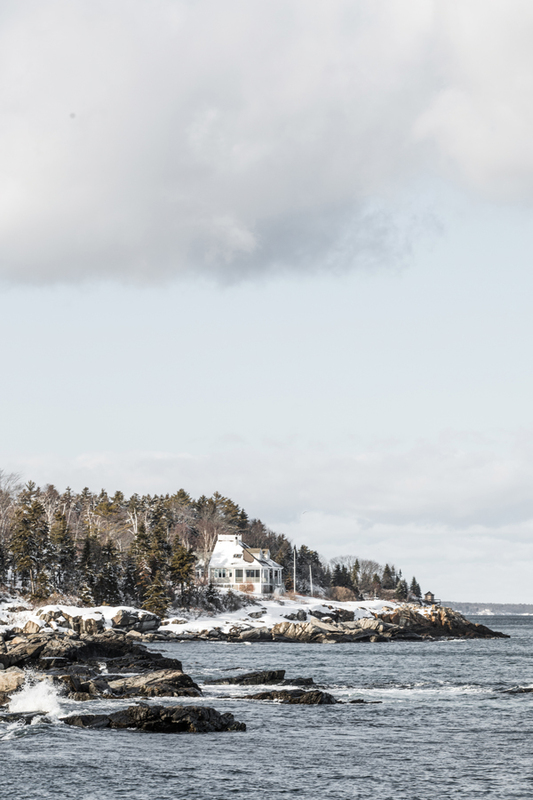 By Thanksgiving, Casco Bay’s most popular tourist attraction looks like it has simply shuttered for the off-season: a bit bleak, often dark, occasionally covered in snow. 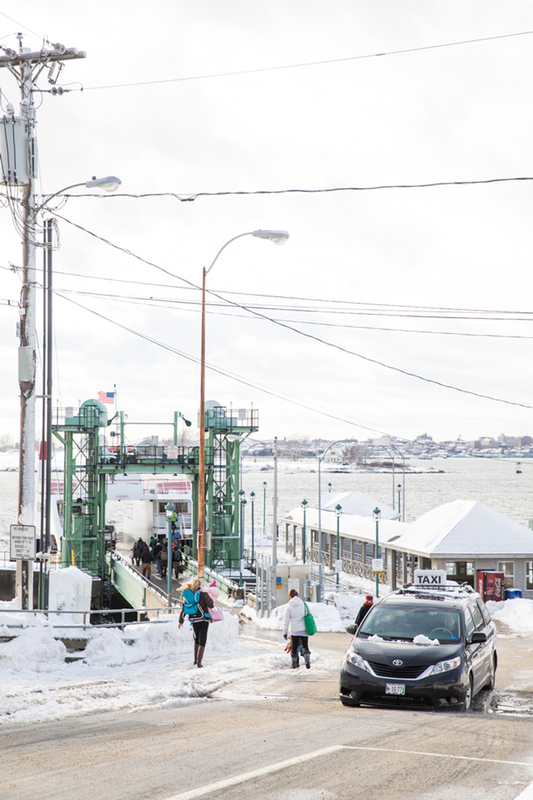 “If you want to know what Peaks Island is really like, you have to live here for at least one winter,” explains Lisa Penalver, a neighbor I bump into most mornings while walking my kids to school. Lisa has a decade of them under her belt, my family and I half of that. Staring down my sixth with equal parts anticipation and anxiety, I decided to ask a few of my neighbors about our love-hate relationship with solitude, about whether they, like me, feel the strongest sense of community when we’re all alone out here, shoveling our walkways and small-talking on the ferry and trying not to get on one another’s nerves. 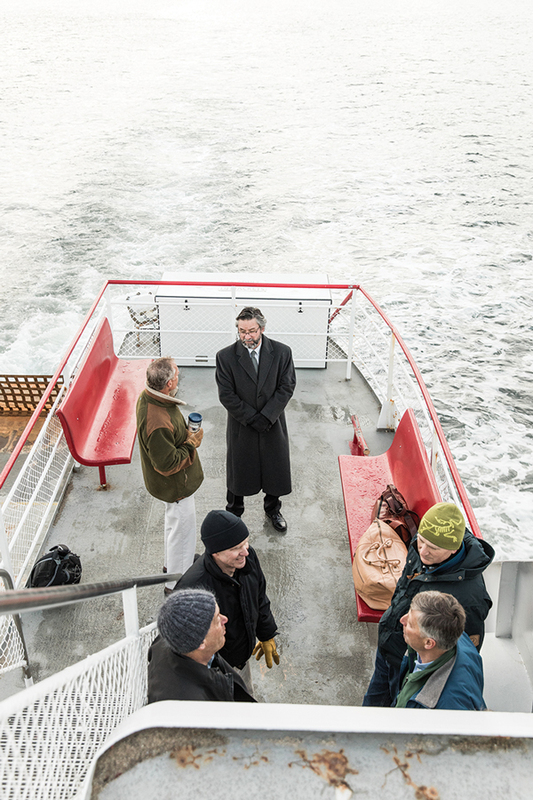 Lisa is the chair of the Peaks Island Council, an advisory body created a decade ago to give Peaks residents more of a voice in city affairs in Portland, of which Peaks is technically a part, though it’s a 20-minute ferry ride and — in winter, especially — seemingly a universe away. 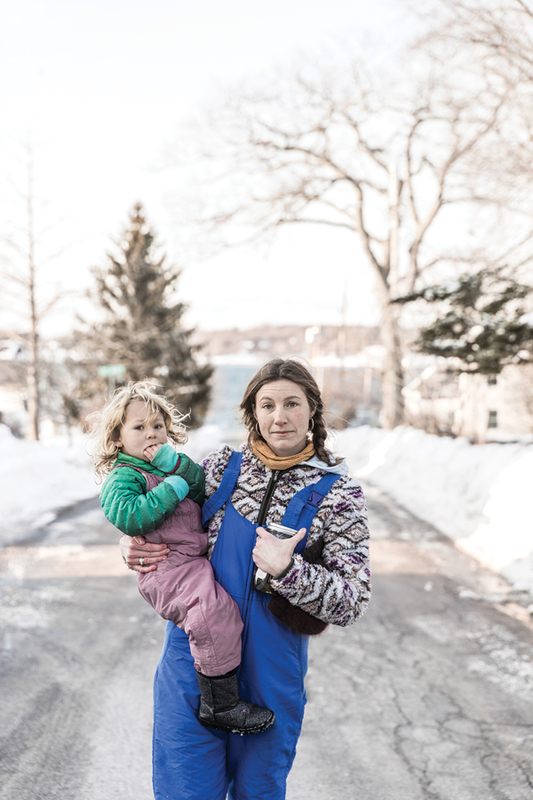 She moved from Alaska to the island where her dad went to high school (back in the 1950s, when Peaks had a high school), looking for a safe place to raise her daughter, somewhere she could let her kid walk to school on her own. 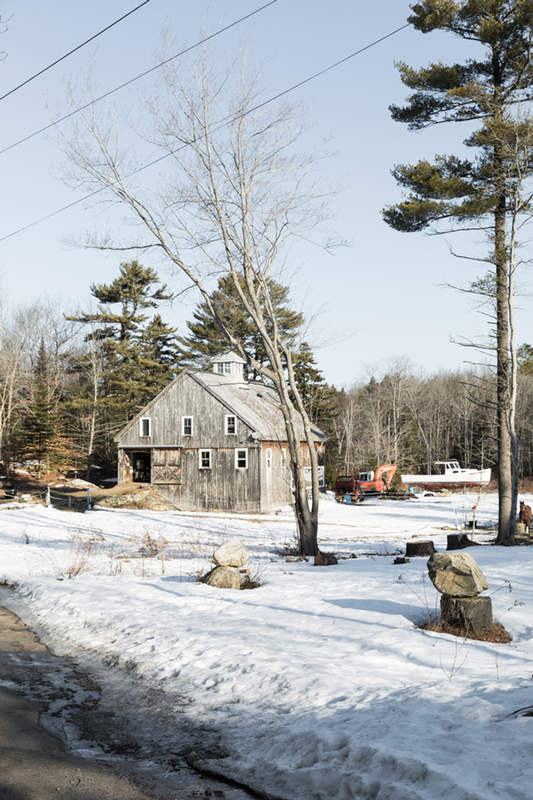 In the summer, Penalver works on-island as a landscaper; in winter, she does graphic design and art. Such seasonal dual lifestyles aren’t uncommon on Peaks. 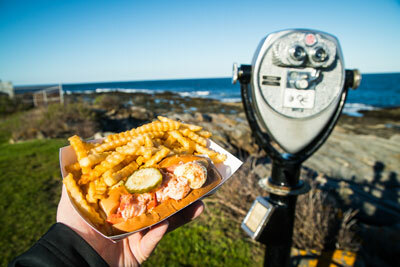 If you want to know what Peaks Island is really like, you have to live here for at least one winter. 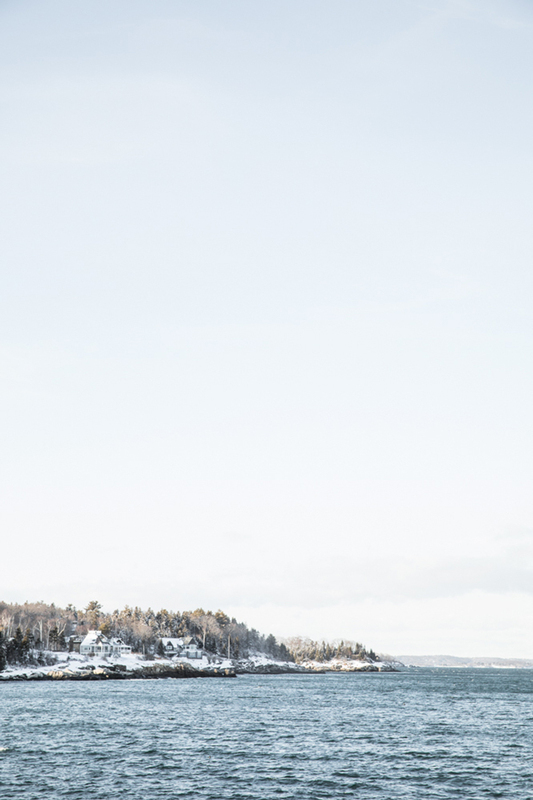 Paradoxically, the isolation of Peaks in winter is what brings islanders together. Because to psychologically survive here during the winter months, when it’s dark before dinnertime, you have to get creative. There are few people in the streets, and most stores and all but one restaurant and a coffee shop are boarded up until June. So you join the Peaks Island Ukulele Band, or the knitting circle, or the laughter yoga club, or Tai Chi at the community center. You go to open gym nights at the school or Saturday night movies at the island library. Something, anything, to avoid growing lonesome. 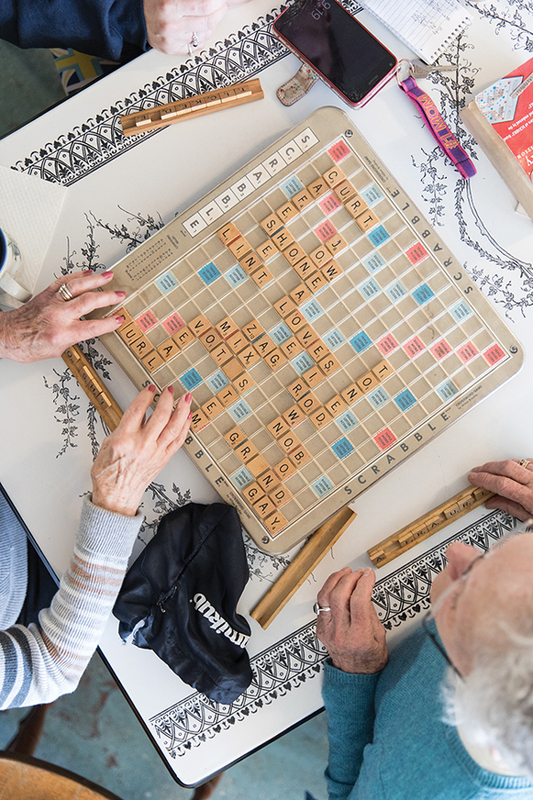 Left to right: Barbara Filipos, Joyce Landry, Becky Lynch, and Kami Lynch play Scrabble at the Peaks Cafe, a winter ritual at the island’s much-loved coffee shop. Increasingly, say longtime residents like Penalver, the onset of isolation feels like a reprieve.  In recent years, the number of tourists and day-trippers to our little island of 750 acres — barely a square mile — has ballooned. 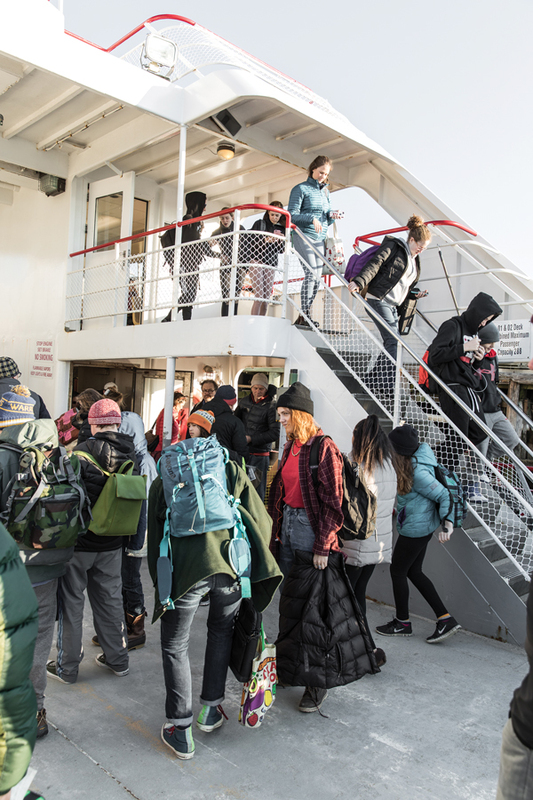 Ferry ridership has increased an average of 2½ percent per year since 2011. Last July, nearly 140,000 people ferried out to Peaks. In the summer months, residents often have to cut in line or extend their elbows just to muscle onto the boat, to get home on time, maybe to pick up their kids from school. It’s why, by summer’s end, Penalver and many islanders all but pine for the cold and dark, the emptiness and sequestration. Before Europeans showed up, the Abenaki people fished and foraged on Peaks, and white settlers started doing the same in the early 1600s. By the 1880s, two villages (called Forest City and Trefethen) had popped up at opposite ends of the island. The names of their founding families — Brackett, Sterling, Trefethen, Littlejohn, Reed — are unavoidable around the island, in our cemeteries and on our street signs. Amy’s childhood memories are of an island that felt slower and more neighborly. The Depression squelched much of that energy, and the city of Portland turned a glut of foreclosed properties into subsidized housing. World War II saw the construction of the Peaks Island Military Reservation, intended to defend Portland Harbor, where nearly 900 soldiers were stationed. Most military families left after the war, but a wave of new civilians settled in their wake. Housing stock was cheap — Portlanders nicknamed Peaks “welfare island” — and by the 1970s, the island had become known as a refuge for frugal young families, artists, and other bohemian types. 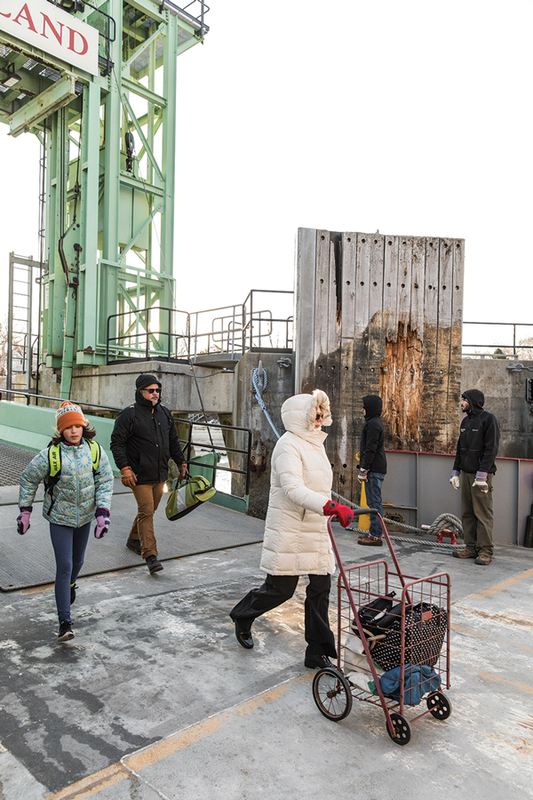 These are the people in your neighborhood — the faces of Peaks Island, from top: artist and teacher Jessica Townes George with daughter, Naomi; Marty Mulkern, head of the island’s public works department; the kids of the Peaks Island Children’s Workshop; Naomi George, snow lover; students May Winter, left, and Simone Daranyi, right, on the ferry; Liz Johnson, kayaking guide and web designer; retired STEM nonprofit director Randy Schaeffer, with canine companion Cerberus; Pastor Angela Rotherham at the island’s Brackett Memorial United Methodist Church. 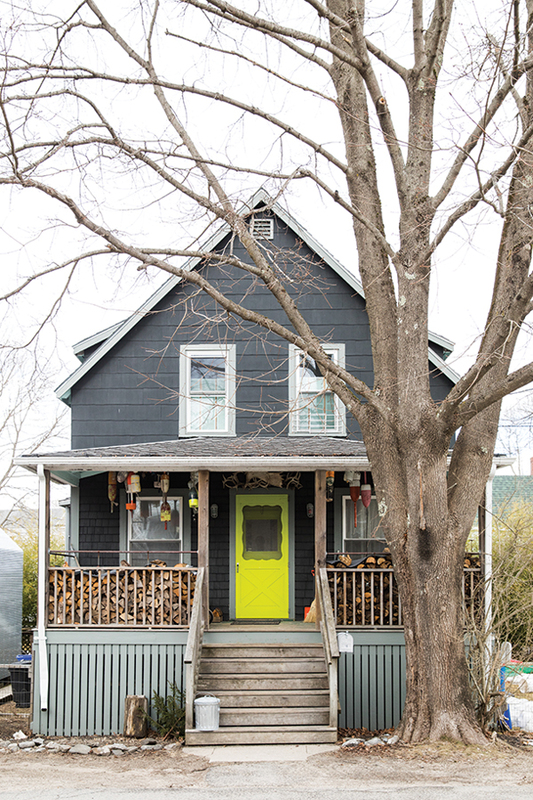 We sit on her porch, chatting as Logan, the younger of her two sons, climbs up and down the steps and periodically begs to be taken clamming down the road on Centennial Beach. About half of Peaks residents commute in and out of Portland; both Amy and her husband, Jamie, work on the island. 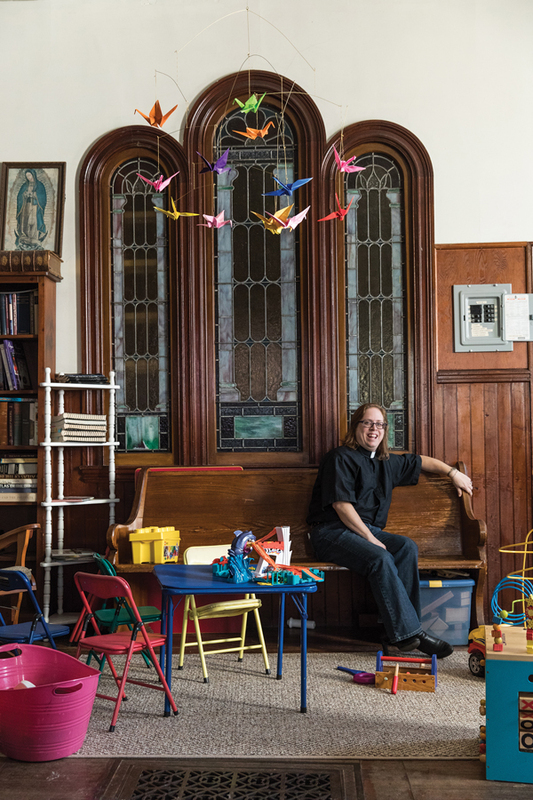 Amy does a little of everything — cleaning homes and municipal buildings, mowing lawns — while taking care of her boys. 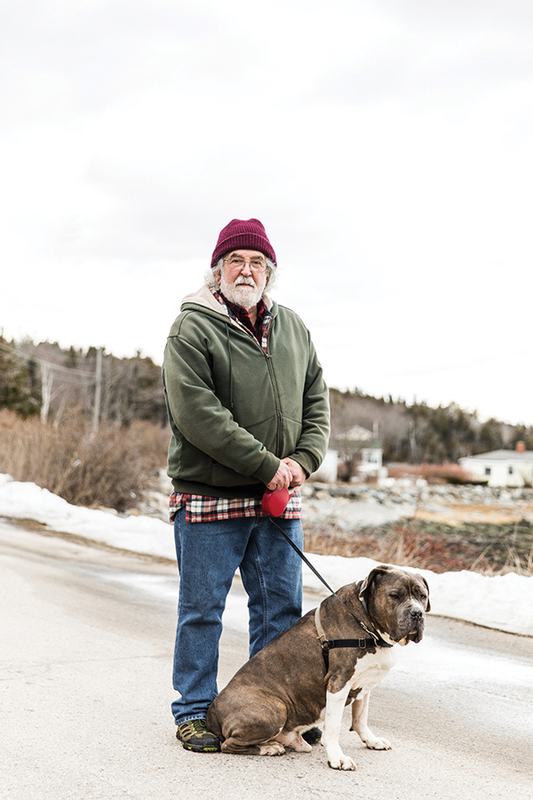 Jamie works for the city — plowing in winter, picking up garbage and recycling, operating a backhoe or an excavator — and he’s a volunteer firefighter to boot. 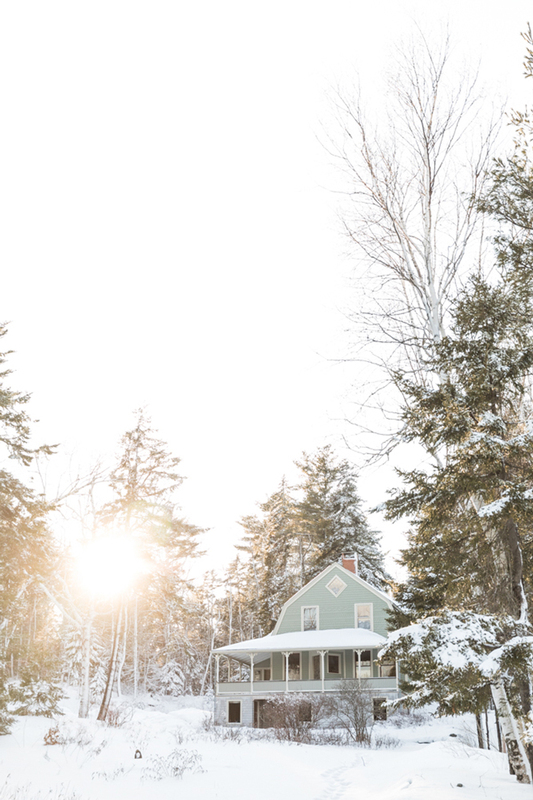 Amy’s childhood memories are of an island that felt slower and more neighborly year-round. She roamed freely as a kid, knew the island’s deer by their nicknames. There were fewer cars then, fewer municipal rules, less attention from Portland City Hall. Fewer retirees migrating from big cities. And next to no giant summer homes dwarfing those of the year-round residents. 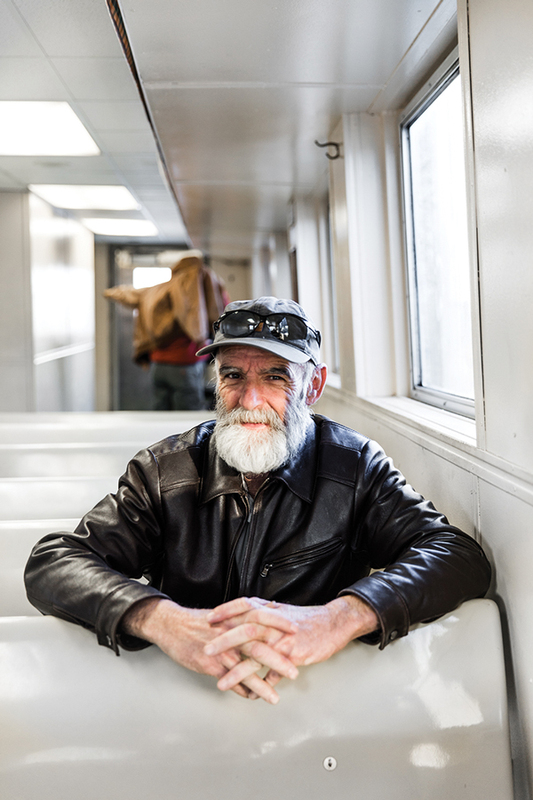 Locals mingle on the Peaks ferry, and the terminal scene is comparatively mellow in winter. 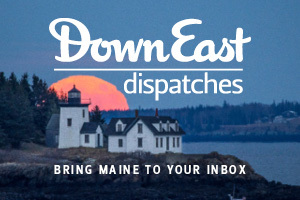 Peaks Islanders have launched six campaigns to secede from Portland: in 1883, 1922, 1948, 1955, and 1992, and with a sustained effort in the late 2000s. The last was prompted largely by rising property taxes and led to an island-wide preliminary vote that found 58 percent of islanders favoring secession. But the state legislature, which has to approve all formal secession referenda, declined to do so twice. 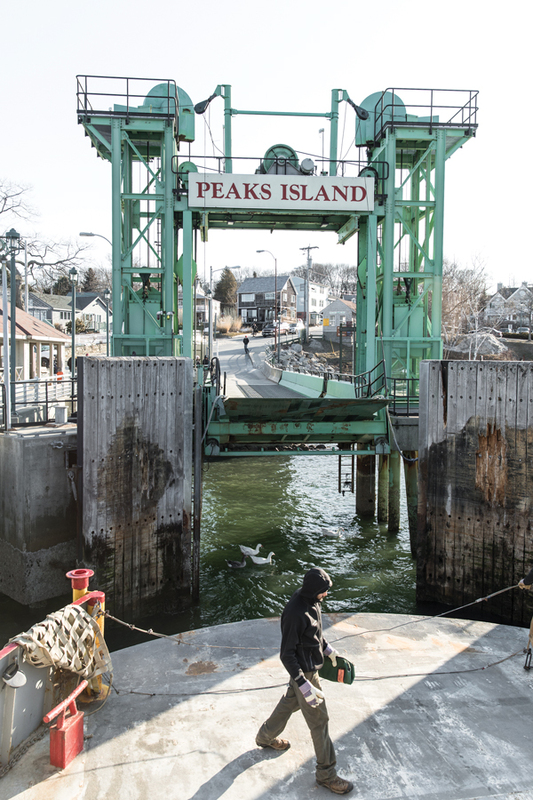 What the island did get was the Peaks Island Council, which meets to discuss islanders’ concerns and advises Portland officials on island affairs. Lisa Penalver joined shortly after its founding; during her tenure, the council has addressed everything from air pollution to a dearth of public restrooms. The council meets every month at the island community center, and Amy Semon (who, for all her nostalgia, voted against secession last time around) is a frequent attendee. 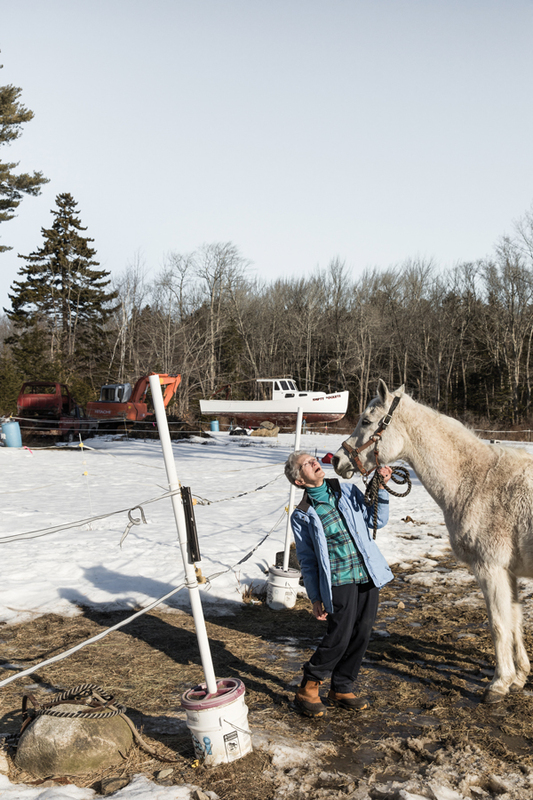 Barbara Filipos works with one of the residents at Horse Island Camp, which leads summer youth equestrian camps and provides a home for rescued horses. May Winter is surprisingly bright-eyed and bushy-tailed when she meets me at the Peaks Cafe at 6:30 a.m., 45 minutes before her ferry leaves for Portland. We’re munching on breakfast rolls as the 16-year-old explains the crux of her daily schedule: she lives or dies by the ferry. But Winter’s used to it. 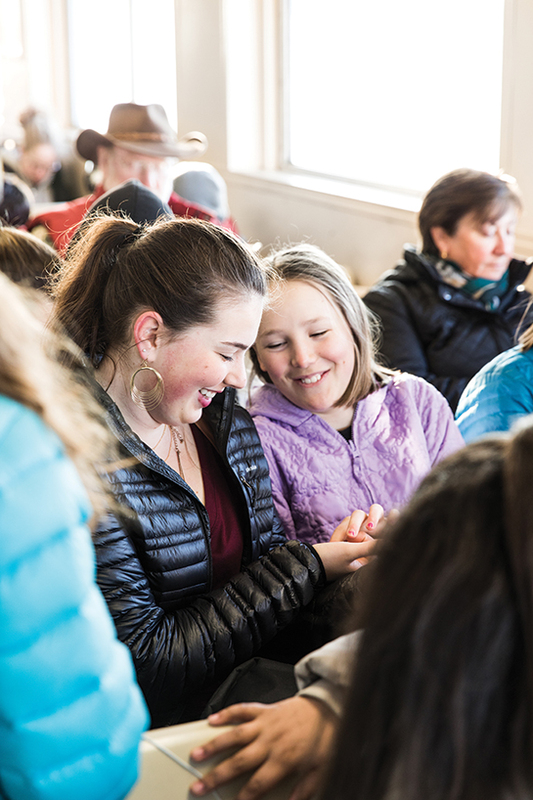 She started commuting to school in sixth grade, when she, like all Peaks kids who aren’t homeschooled, began attending middle school on the mainland. These days, the ferry and a short walk bring her to Portland’s Baxter Academy charter school, where she’s a junior. It’s a rite of passage for Peaks kids, and it teaches them responsibility, among other things. 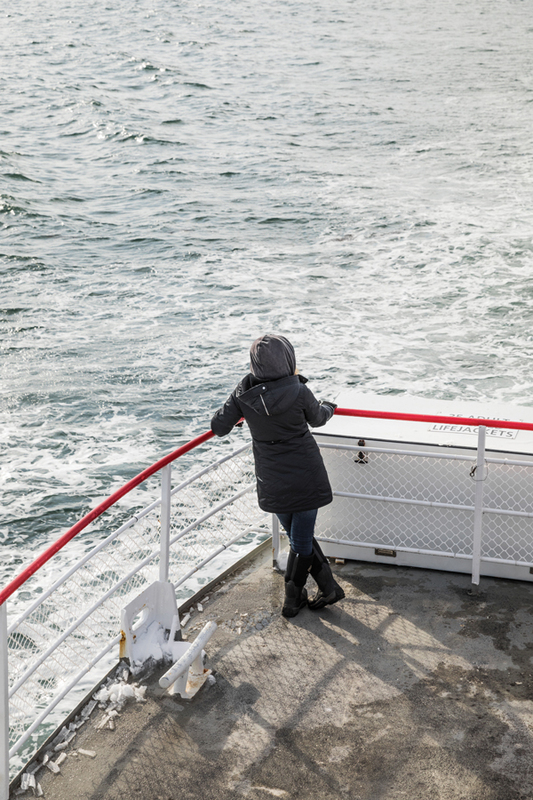 After school, Winter has to hustle to make the 3:15 ferry. Often as not, she has activities or simply hangs around downtown Portland with her friends, then takes the 4:30 or 5:35 boat. Should she miss the 5:35, she’s stuck until the 7:15 ferry boards — which means she’s not home until 8 p.m. The ferry, May says, has taught her how to grow up, how to be more self-reliant and move easily among folks decades older than she is. Life on the island seems to begin once the 7:15 ferry has left. 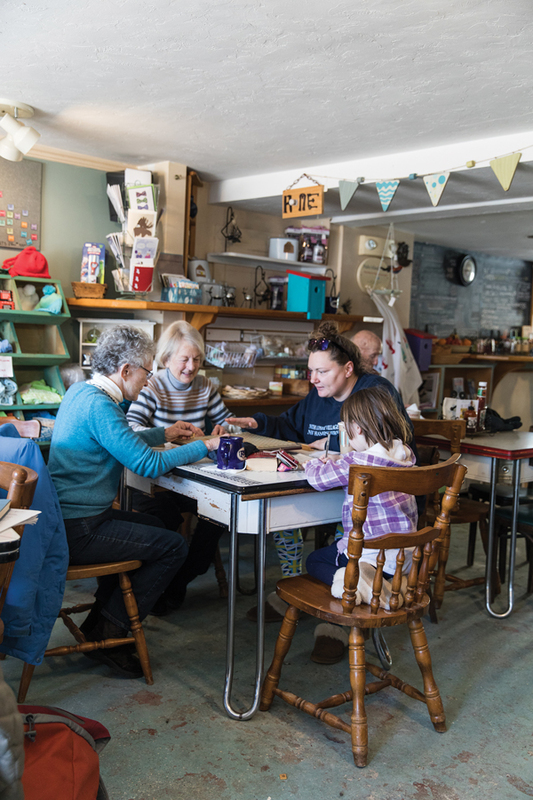 As we chat, commuters pop in and out of the Peaks Cafe — where owner Lisa Lynch and her right-hand woman, Ellen Huston, have memorized most folks’ daily orders — before heading to Portland for the day. Peaks is the only Portland neighborhood where almost all residents rely on public transportation. 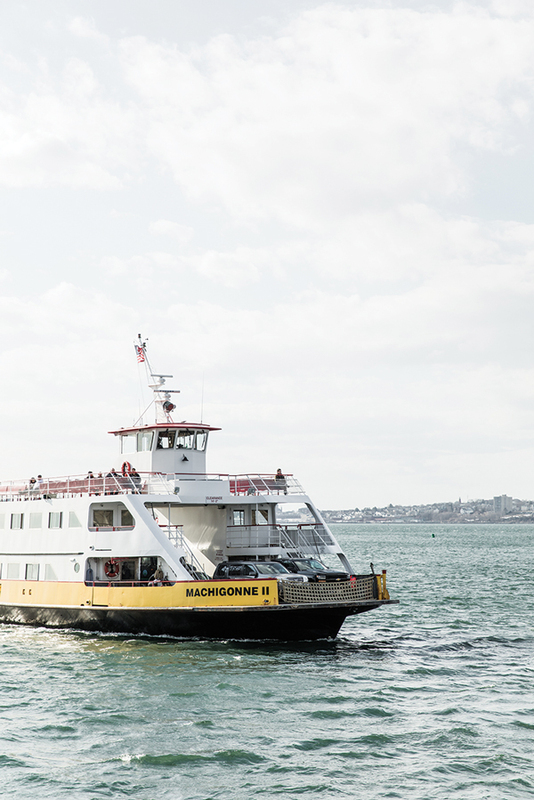 A toot from the ferry indicates the one-minute warning, and Winter and the other cafe-goers sprint to hop on before it pulls away. Life on the island seems to begin once the 7:15 ferry has left. The class bell rings at the elementary school. 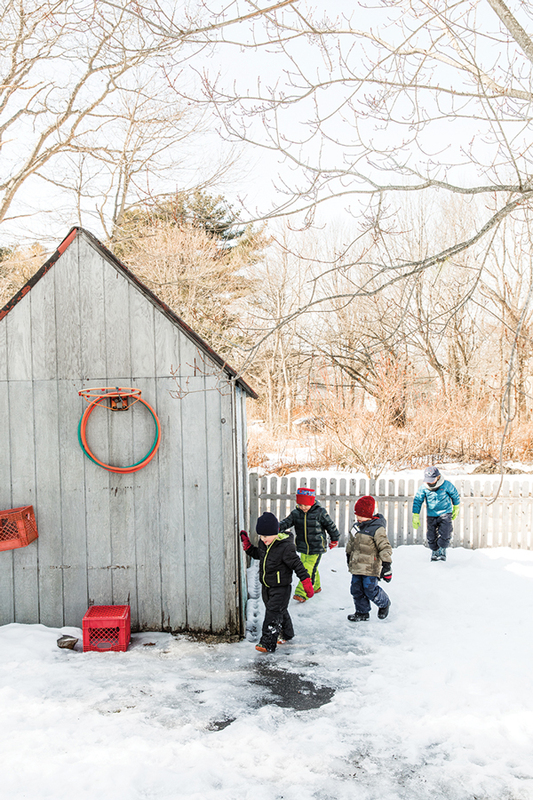 Over at the Peaks Island Children’s Workshop, the island’s daycare, the kiddos bundle up for a walk around the island. They call themselves “The Mighty Mondays” because they spend every Monday morning outside, exploring on foot. No rain, snow, or sleet stops these toddlers (or their intrepid teacher, Celeste Bridgford) from hitting the island’s trails. Today, the Mighty Mondays will cover more than 5 miles (Bridgford tracks it on her Fitbit). Many kids (including mine) who have yet to remove training wheels from their bikes nonetheless know how to navigate the island. They know the names of the postal workers and the clerks at Hannigan’s grocery (“If We Don’t Have It, You Don’t Need It”). They walk to visit Priscilla and Roseanne, the island librarians. They visit the transfer station to see the big trucks, and they sing songs at the senior center. They make field trips to the Island Community Garden or to see Stan the tree repair man. Sometimes, the visits are reversed, with islanders dropping by the daycare to talk about their jobs, hobbies, skills. 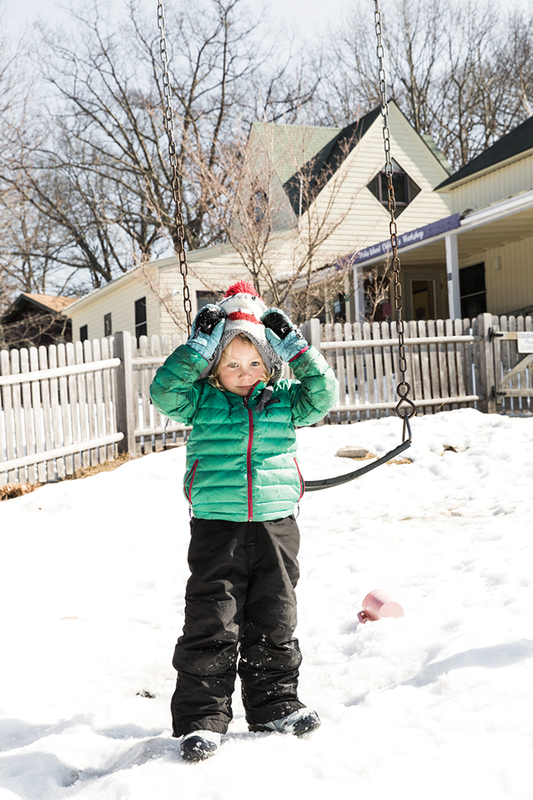 The island’s kids know all the people in their neighborhood; Mister Rogers would be proud. 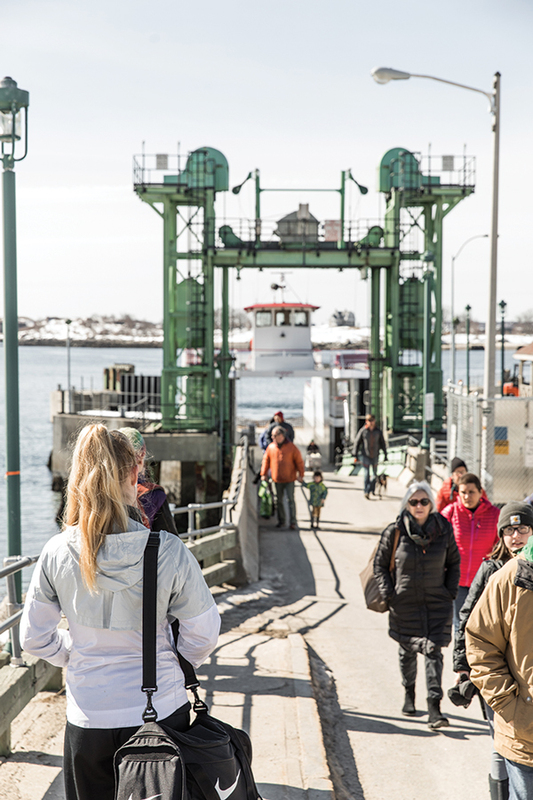 In winter especially, when they’re not sharing it with hordes of tourists, the ferry is where Peaks Islanders rub shoulders with their neighbors. Faith, 57, moved to Peaks from New Hampshire with her husband, Larry, 19 years ago. We’re sitting with a few other islanders in the first-floor living room of Jim Greenwell and Emily Magal, who sometimes host small concerts that Faith organizes. 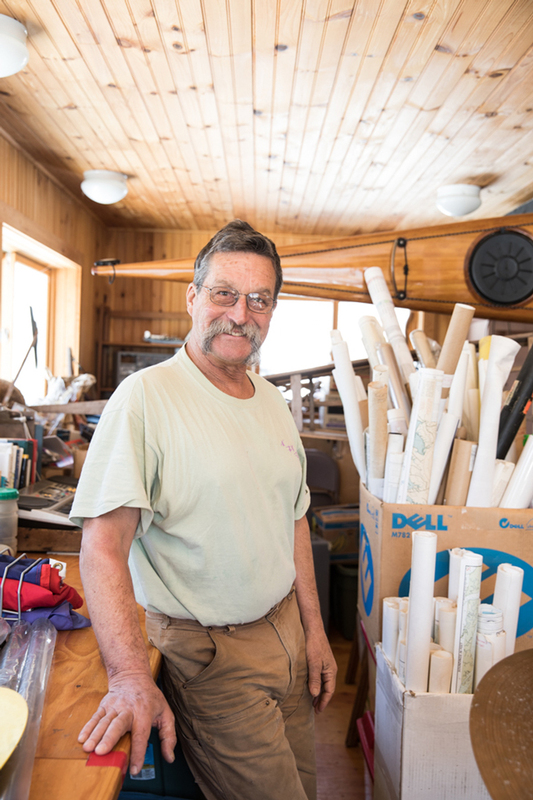 We’re discussing all the contrasts — between summer’s throngs and winter’s quiet, between knowing your neighbors and knowing your neighbors’ business — that make Peaks Island what it is. 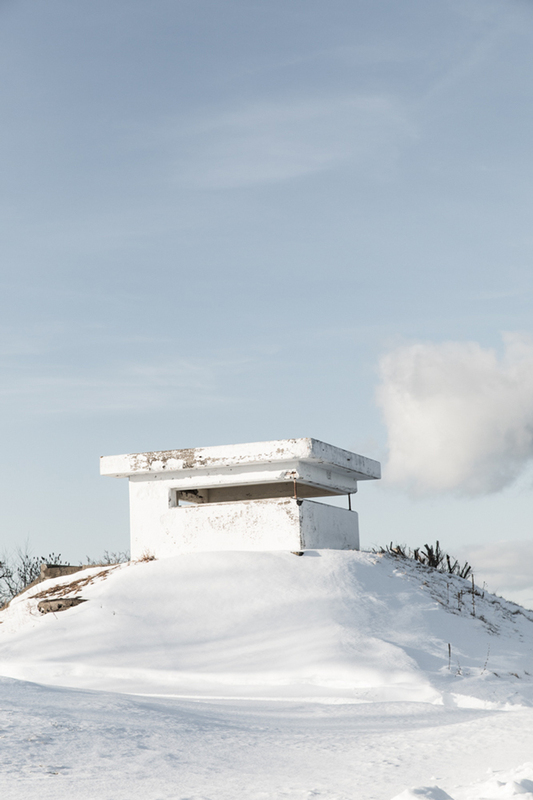 On Maine islands like Peaks, vehicles registered for island use are exempt from state inspection laws; for the touristed island’s year-round residents, winter can feel like a reprieve; though a neighborhood of the city of Portland, the Casco Bay island can feel a town apart; now abandoned, the Battery Steele military installation was completed on Peaks in 1942. Outside, we hear the ferry’s warning toot, this time signaling the imminent departure of an afternoon boat. 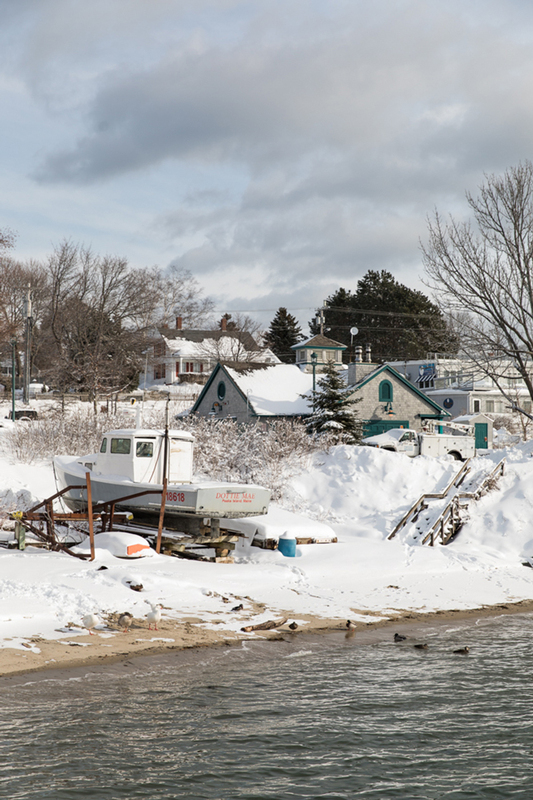 Snow-covered fishing boats are a common winter sight around the island; Peaks resident Ned Shenton calls his cottage, crowded with books, “Safe Harbor”; Horse Island Camp is an equine rescue center and youth camp; islander Tom Bergh is a Master Maine Sea Kayak Guide. Faith nods in agreement. This time of year, she’s busy coordinating music for the island’s holiday programs. She also directs the Peaks Island Ukulele Band, spearheads Peaks Fest in the summertime, offers piano lessons, and teaches a morning class at the Children’s Workshop. 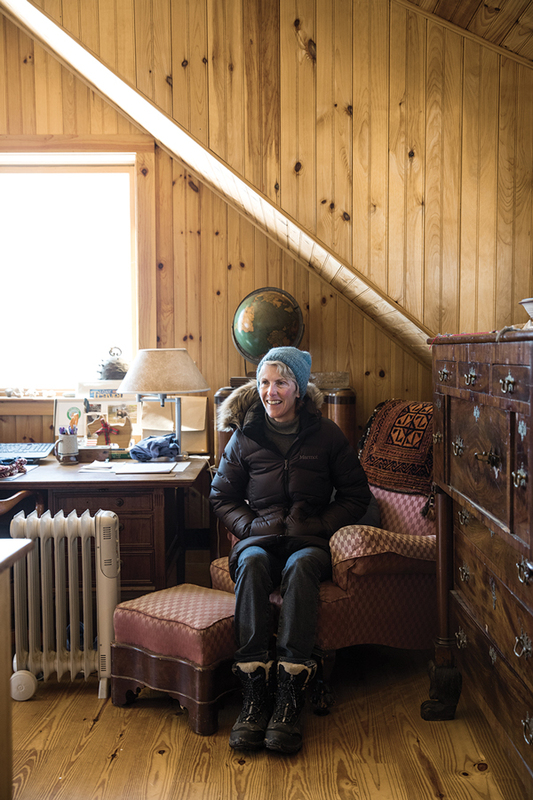 “I think people suppose that living on Peaks Island is about isolation,” she says, “but in reality, it’s the absolute opposite. 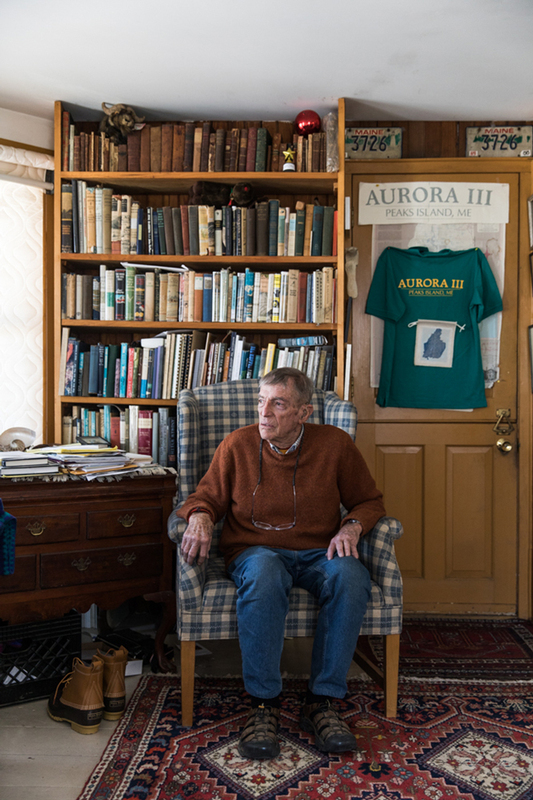 And all the reasons we moved here — the beauty, the fun of it — they’re all peripheral now.” Another toot from a boat horn outside, and we all pause to gaze out Jim and Emily’s huge living room window at the boats and the birds of Casco Bay. Mira Ptacin is author of the memoir Poor Your Soul (Soho Press, 2016) and lives on Peaks Island with her family. 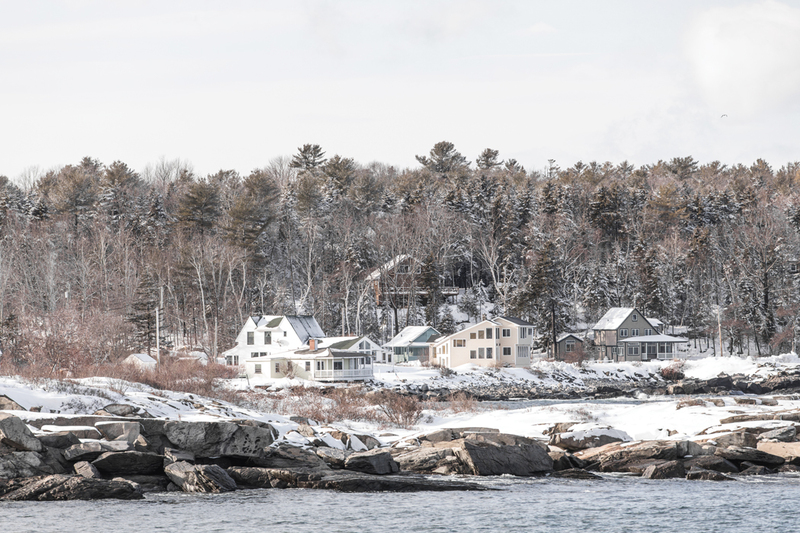 Try a winter alone in remote oceanside DownEast, not a 20 minute ferry ride from Portland. 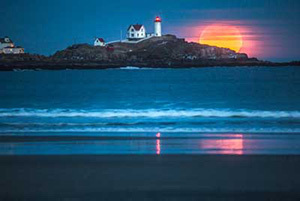 Loved the article…I am actually getting ready to move to Chebeague Island…can’t wait to get moved…MAINE…HERE I COME!!! Really enjoyed reading this. Thank you for sharing.